Legacy is a key priority among ultra-wealthy Americans. 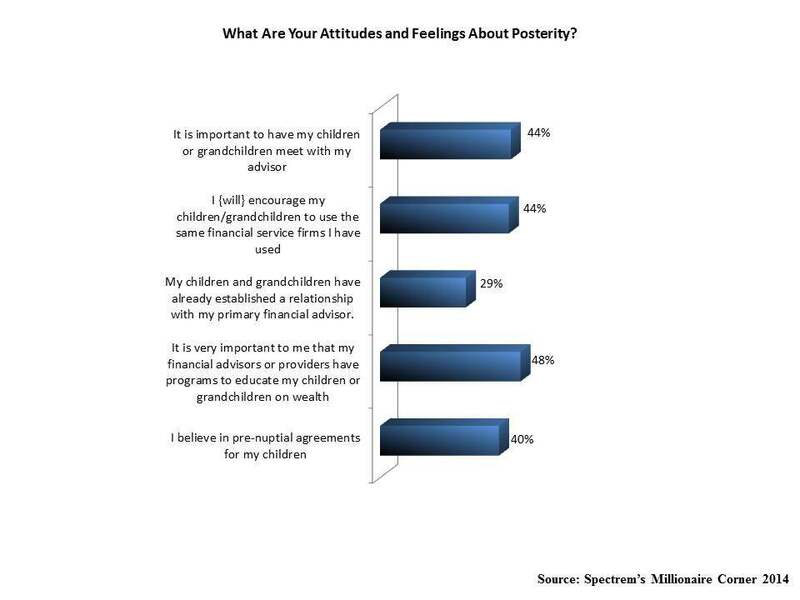 Roughly two-thirds cite the legacy they leave for their children or grandchildren as their primary personal concern, according to a new wealth level study conducted by Spectrem Group of households with a net worth of at least $25 million. More than maintaining their own current financial position, the $25 Million Plus investor is more concerned about their children or grandchildren’s well-being (83 percent), that they are raised to be financially responsible (79 percent) and that their wealth not be allowed to be detrimental to their work ethic, educational or career plans (70 percent). One of the things the ultra-wealthy want to pass on to their children is their financial knowledge, a responsibility they seem to be more prone to conduct in-house. Less than half would cede that responsibility to their financial advisor, the Spectrem report finds. Roughly half (48 percent) do consider it important that their financial advisors or providers have programs to educate their children or grandchildren on wealth, while just over four-in-ten (44 percent) think it is important that their children or grandchildren meet with their advisor. The same percentage said they would encourage their children or grandchildren to use the same financial service firm they use. Age and wealth are not significant factors in shaping the ultra-wealthy’s attitudes about posterity. Not surprisingly, among $25 Million Plus investors, the wealthiest (those with a net worth of at least $50 million) are the biggest proponents of pre-nuptial agreements for their children (50 percent vs. 40 percent of respondents overall). It is also most important to those with a net worth between $50 million and $124.9 million that their children or grandchildren meet with their advisor (50 percent vs. 44 percent of ultra-wealthy respondents overall). Only 29 percent of ultra-wealthy respondents report that their children or grandchildren have established a relationship with their primary financial advisor. When asked at what age children or grandchildren should be introduced to their financial advisor, the highest percentage (31 percent) said between the ages of 18-25, followed by over the age of 25 (27 percent). Baby Boomers between the ages of 56-65 were the most likely to believe their offspring should be introduced to their financial advisor between the ages of 18-25 (41 percent), while seniors over the age of 66 would be most likely to wait until their offspring were over the age of 25 (32 percent). The oldest respondents were also much more likely to insist the age didn’t matter (37 percent vs. 20 percent of respondents overall).